Our cultural history of training dogs is laced with Person shows Dog types of principles. As if a person can actually “tell” a dog how to sit, when every dog knows how to sit at about 3 weeks old. But the process of training used to be focussed on taking away what was not desired and leaving the residue as “correct”. Sometimes this was identified with praise, and latter treats. We still push on focussing on reducing error as opposed to seeing error as vital information. Example: when teaching heelwork (heeling) and the dog begins to drift out of position / look away / sniff the floor / bark, the person’s response is to force a correction this error. Often a lead twitch, a pull tighter to end the undesired. Or that illogical need for escalating personal abuse with a slap on the thigh ((I can hear the dog chuckling at this). At the very least our mouth will open to remind the dog of the exercise. “Heel”. “Close”. None of these responses are likely to remove the lack of skill that the error has demonstrated. In reality they may increase its likelihood. We also need to question what “heel” or “close” actually requires? Is it find the position, move to the position, the position itself or hold the position? With my logic, if the dog is on my left and beginning to drift away to their left, I would firstly question my own behaviour (am I causing this? 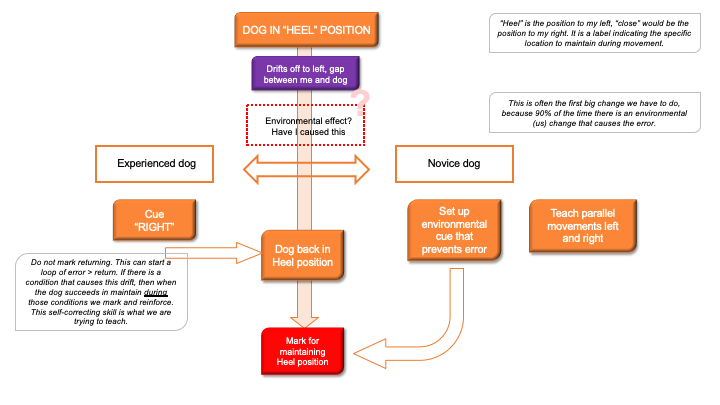 ), secondly I would question what cue can I use that they are skilled at recognising and performing, with my experienced dog this would be “move right”, with my inexperienced dog return to a protective environmental cue that maintains the position (a wall alongside their left) and at the same time work on the behaviour of a parallel step to their right. Were you at fault and not the dog – are you walking a true straight line? Does the dog have the skills to make minor adjustments to the natural drift, a closing-in action, holding and sustaining a target position? Does the dog have a background of mental stamina training to be able to hold a focus under duress of busy environments? Has the dog been physically prepared to hold this athletic position? Just communicating to the dog “you are wrong, correct it”, is not training and certainly not teaching. Are you ready to look at a different way and take on the challenge of changing your mind-set and habits? It takes a re-build of habits, habits that have often been built over years of training and beliefs. Avoid a mix and match. Part of us wants to change just one small thing, but the recipient of these changes is the dog and a potpourri of things that tell the dog “this is new”, mixed with “this is the same-old-same”, can be confusing. We may need to step aside and look at a new exercise to explore the changes and build new habits from ground level. But many of your existing skills will be perfectly valid and brought forward, so the journey may be uphill, but not for long. Find a feedback system. It may be your friend called Video. Review it, many times and see what you need to see, lift out the achievements. Feedback is just the next thing to work on/change, not a criticism of what you cannot do. The potential fallout will be an increased ability to question existing understanding, make adjusts, self-examine, learn new habits. If that sounds exciting, I think perhaps you have the traits that will make significant differences to your own learning and our world of dogs.